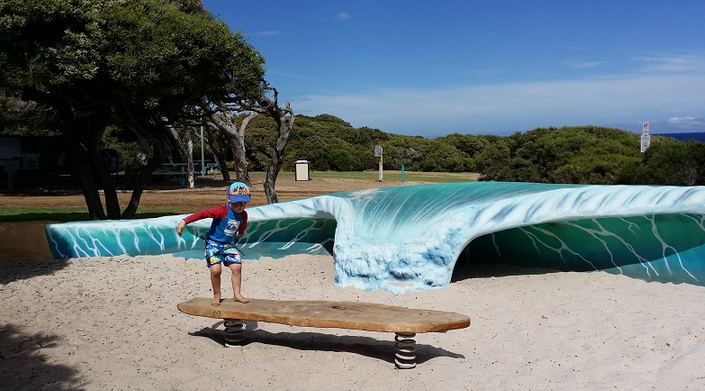 40+ Places You Must Visit With The Kids in Perth & WA Before Summer Is Gone! 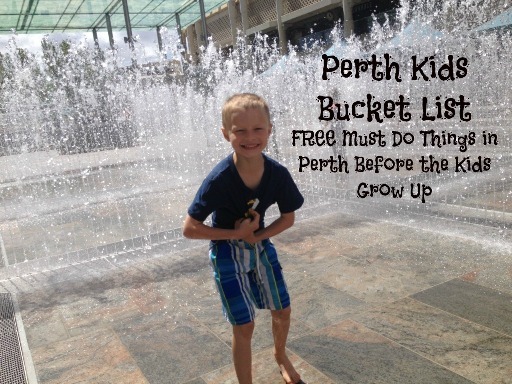 Beat the heat this summer, and start ticking of the Perth Kids Bucket List - Summer Splash Edition! 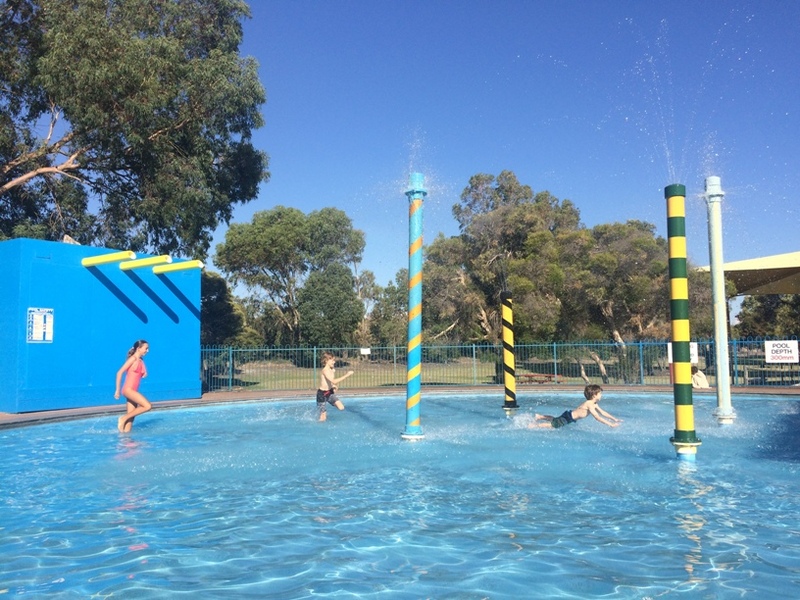 Here you'll find free, cheap and treat day ideas to keep cool this summer in Perth & WA! 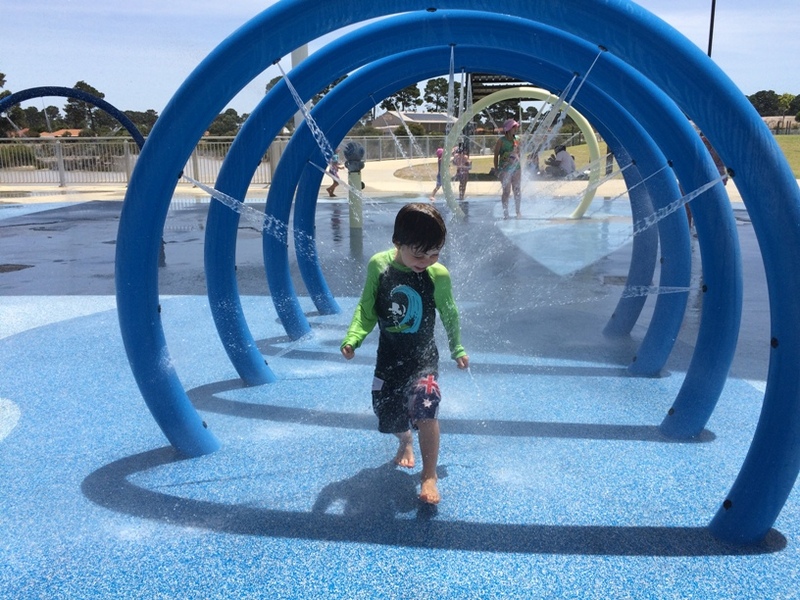 The best water slides, water playgrounds, playgrounds with water play features and beaches in Perth - and if you are holidaying elsewhere in WA this summer holidays there are also some great places to keep cool right across WA! Please note: these are not listed in order of our preference, they are listed randomly. 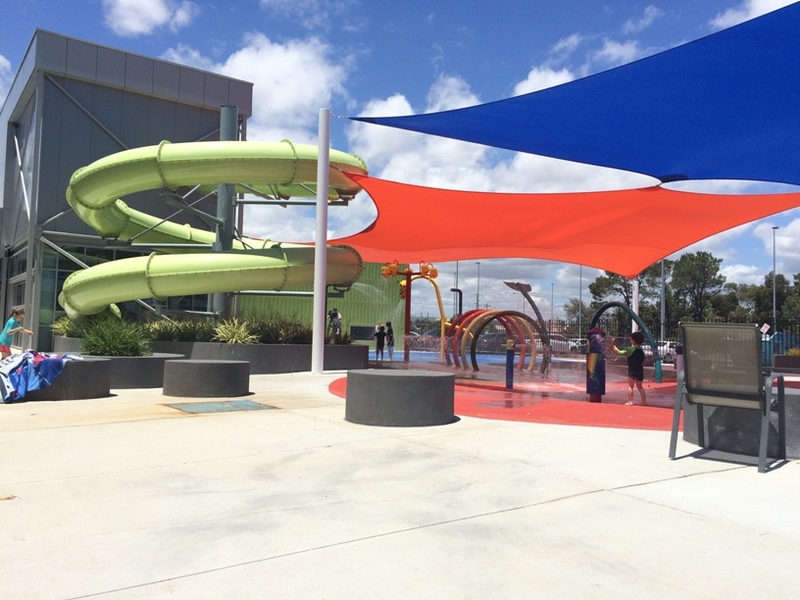 The Ellenbrook Water Playground (also known as Rainbow Waters) is usually turned on for summer in November. 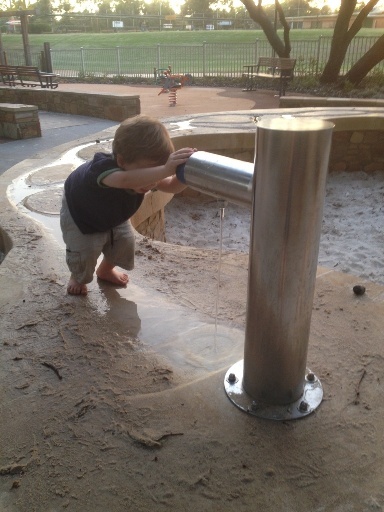 Entry and use of the playground is free and features zero level water sprays & cannons. 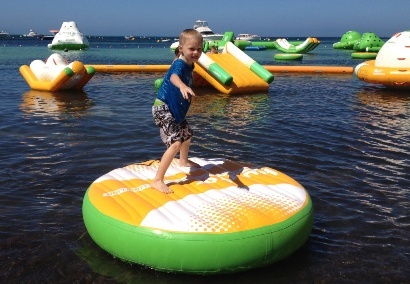 Just a short swim off the Hillarys Boat Harbour Beach or from the jetty - this pontoon and slides can be found here all year round. 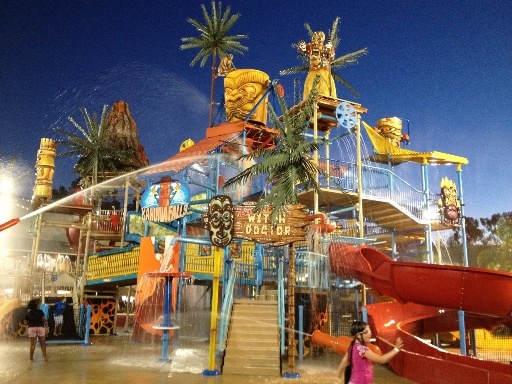 Outback Splash Waterslide Playgrounds is a must do this summer season. Comprising of mostly water slides (some have height restrictions) and spray features around the outside. Make sure you plan to spend the day here, so much to do! 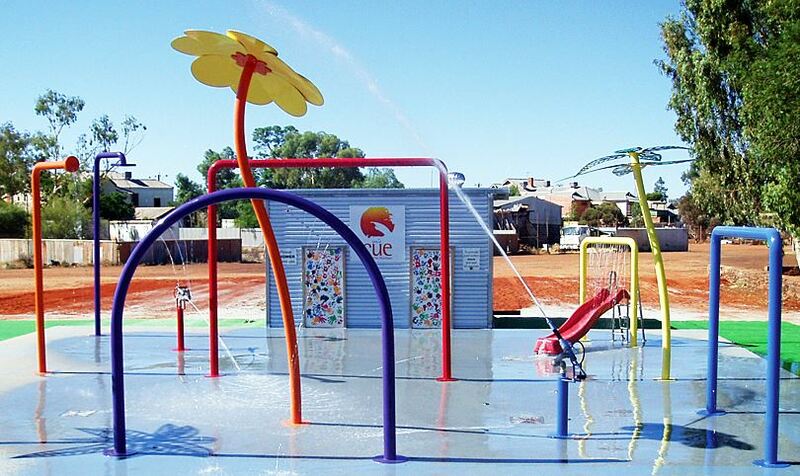 This fantastic playground features a fun water play features, with troughs that are filled using a manual water pump. 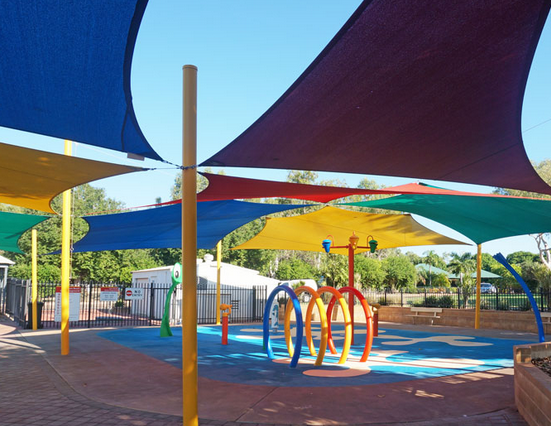 Not a lot of shade at this playground so it's recommended for a warm evening play or dinner out at the playground. Another must do this summer for kids under 5yrs. 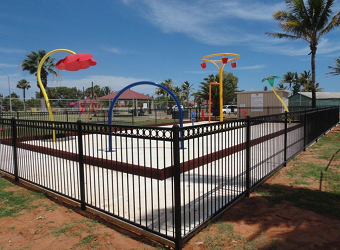 With affordable entry for families and a series of shallow pools, a splash pad and play equipment - this one will definitely wear them out! This is serious fun and not just for kids! Season starts early Dec in Mandurah & early Nov at Rottnest. 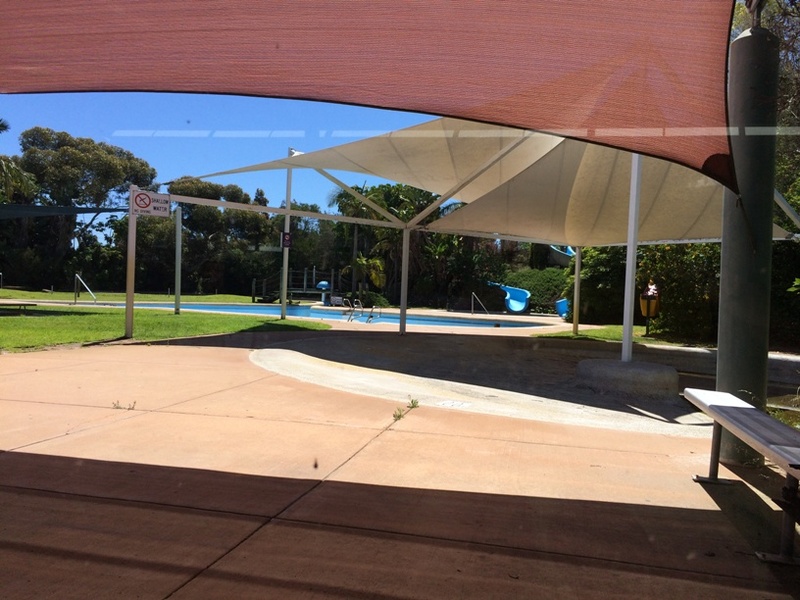 Open every day at Rottnest, and everyday of the school holidays and on weekends in Mandurah. 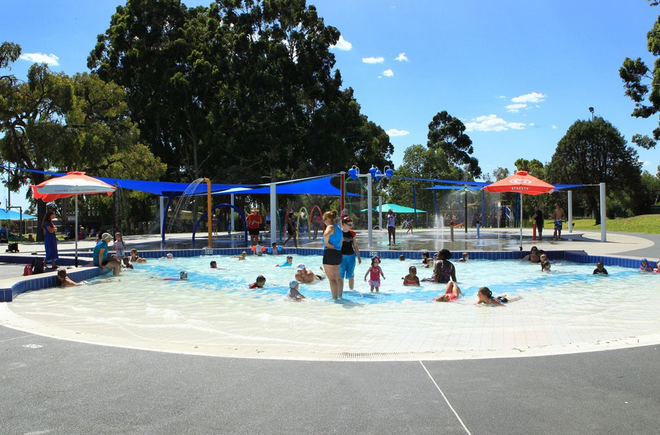 Knee Deep section for under 7's (adult supervision required) $7.50 per half hour. 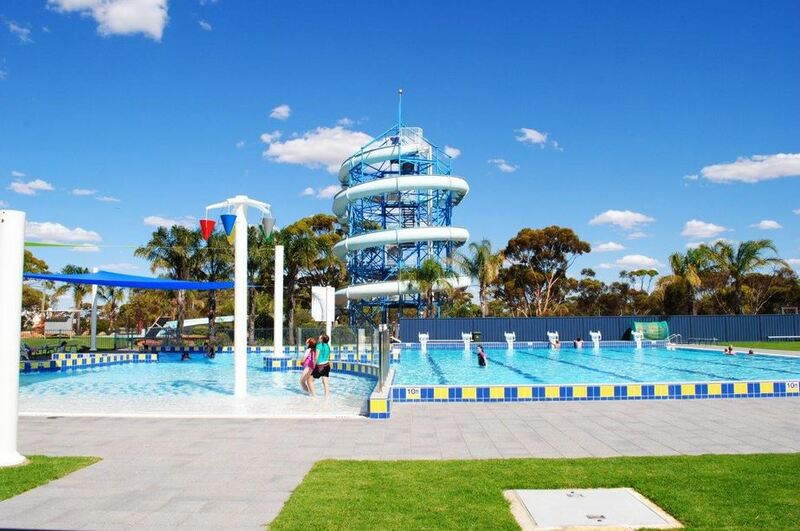 Main Aqua Park for 7 yrs + from $12.50 for half an hour, family passes and all day passes available - this is a great one for the whole family with older children to enjoy together! 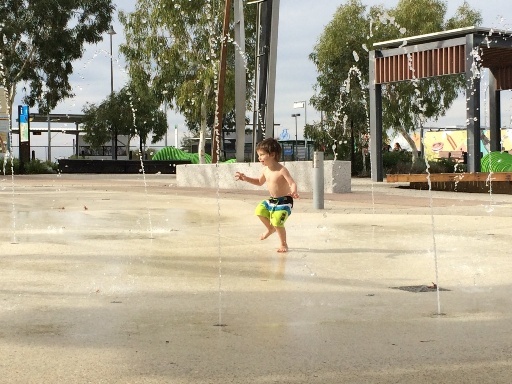 Make a day of it, and catch the train, this water splash pad is right outside of the Cockburn Central Train Station and runs all year round! Lots of shade and the awesome Mooba Cafe right alongside the Water Park to enjoy a coffee. Kids can also enjoy giant outdoor games here like Connect 4 & Ping Pong. Heading into Perth City? 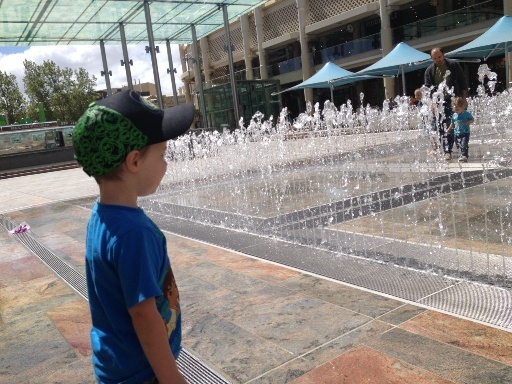 Well make sure you pack a spare set of clothes as the Forrest Place Water Labyrinth runs all year round! (see the Water Labyrinth website - link in our review above to days it is turned off for events). 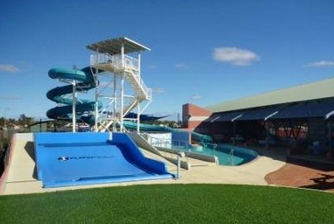 The 50m waterslide is open weekends all year round and in October and January Holidays 11-1pm & 1.30-3.30pm. 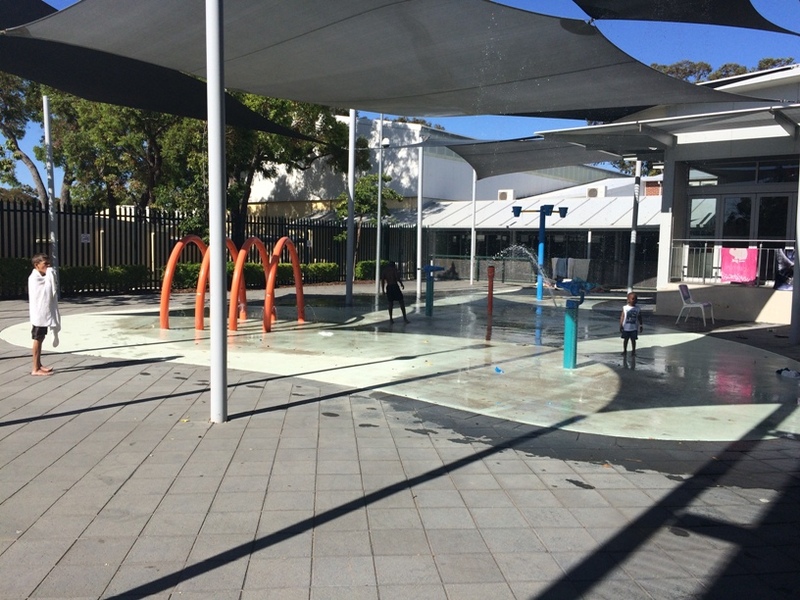 Close to the city and located in the magnificent Hyde Park, your kids will love the tipping buckets, water cannons and sprays of the FREE water playground. Lots of grassed area for a picnic and BBQ's nearby. Great playground just short stroll from the water playground too. 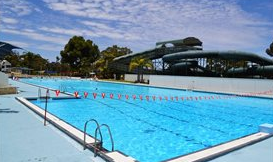 Alongside the outdoor pool is a great zero level water playground which is fenced off from the main pool. 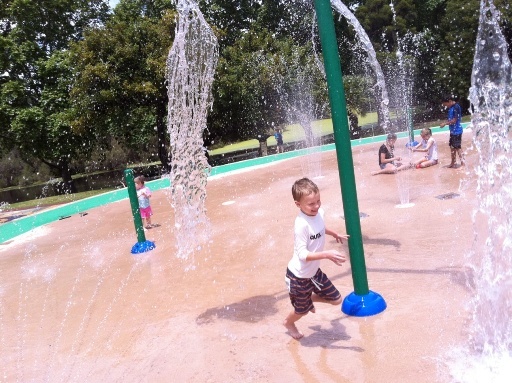 The water playground runs all year round and you can use the water playground as part of your entry fee. 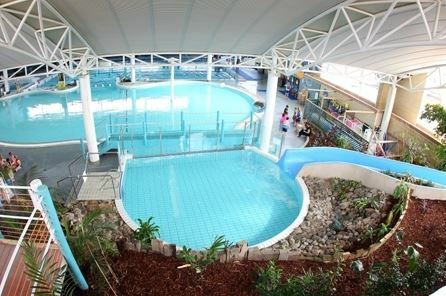 This is the old Kalamunda Wet & Wild. Two big slides here, the Zig Zag Slide & Corkscrew - kids must be 5 years or older to ride these exhilarating slides. BBQs available to use so bring your lunch and spend the day. 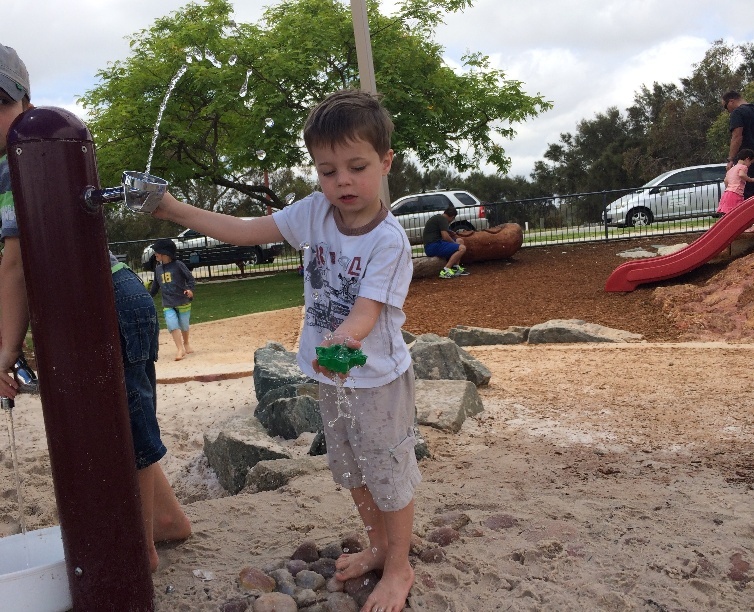 This playground is designed specifically for the under 5's with lots of sensory play, low level play features and this fantastic water play feature. Two indoor slides for the bigger kids (must meet minimum heigh requirement 1.1m) and a small frog slide for crawlers and toddlers. 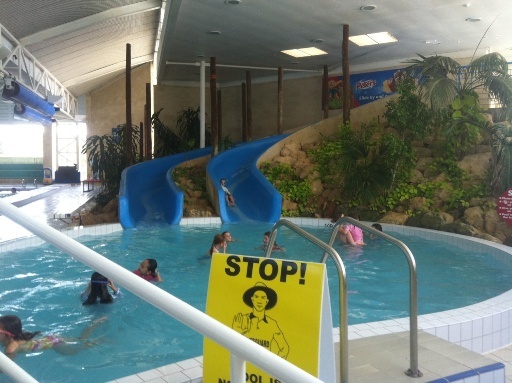 Open: Pool open and access to toddler slide and two indoor slides all year round. 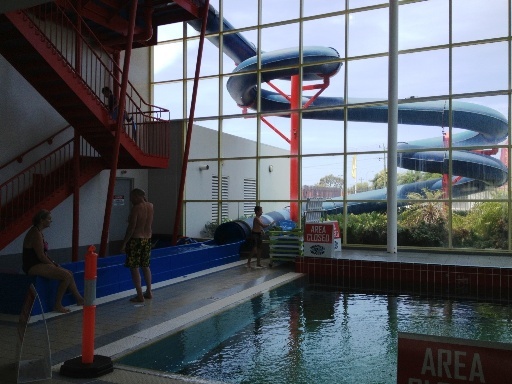 Two indoor water slides may be closed for short period of time when lifeguards changing over. Water spout garden and water mist that comes out the top of the volcano - a spare change of clothes is a must for this playground! Great playground and toddler playground here too around the bottom of the huge volcano. 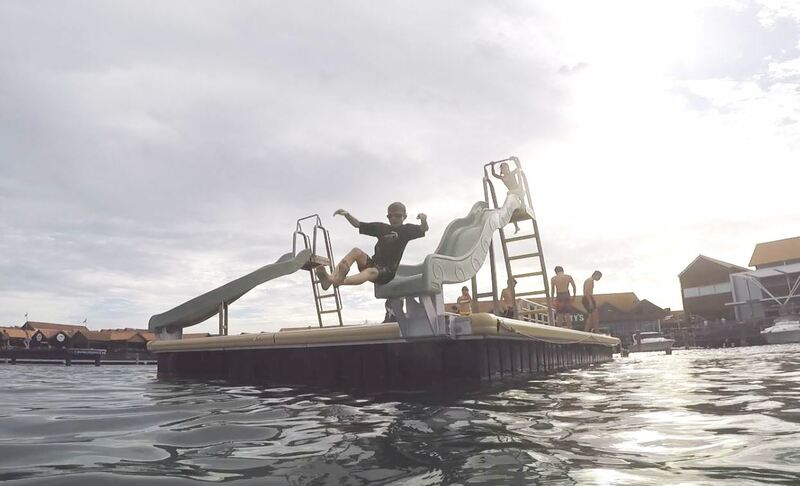 Swim out to the pontoon and slide into the cool ocean at the beautiful Coogee Beach. 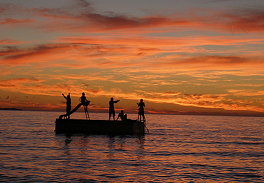 Kids will need to be strong swimmers to swim out to the pontoon and close adult supervision is required. 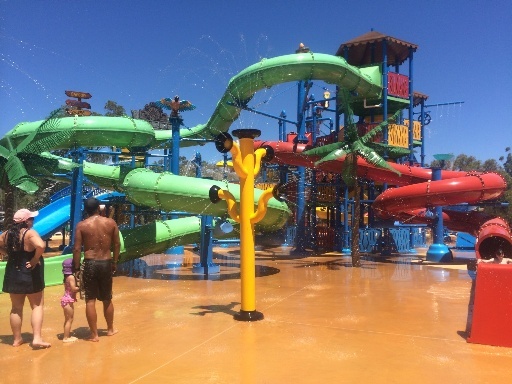 Two great playgrounds, the amazing Kahuna Falls Waterslide Playground (pictured above) and Kingdom Falls a smaller water playground for younger children in Dragon Kingdom. 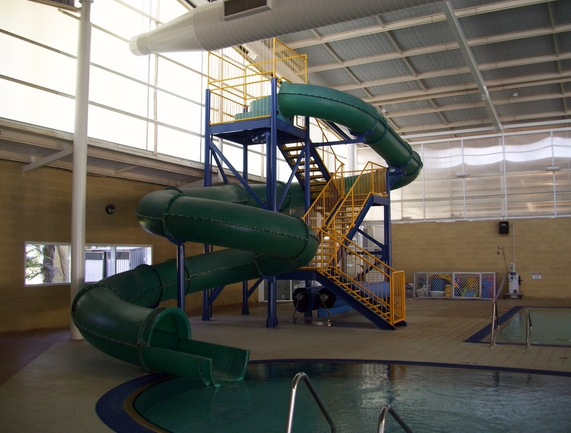 And of course lots of different water slides, including mat slides, speed slides & rapids for big kids and adults. Open: (Usually September to April) Must be 100cm to ride the slides of Kahunu Falls. The maximum age in the Kingdom Falls zone is 6 yrs. 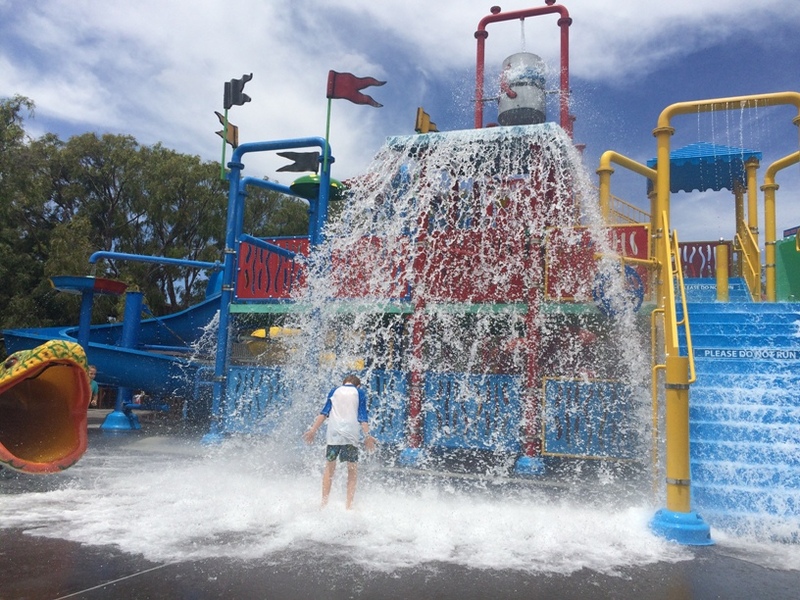 Height restrictions may apply to the other water slides at Adventure World also. See Adventure World website for details. 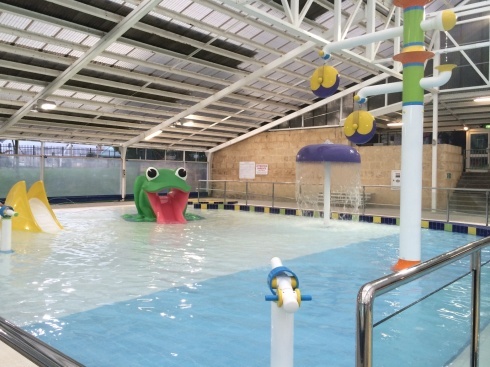 Age: Indoor twisting slide - no age restrictions (little ones may need parents to ride with them), small rowing boat slide recommended for 3 yr and under. Open: Winter weekends only 12-2pm & 2.30-4.30pm. Summer season Oct - Mar, 11-1pm, 1.30-3.30pm, 4-6pm weekends & school holidays. 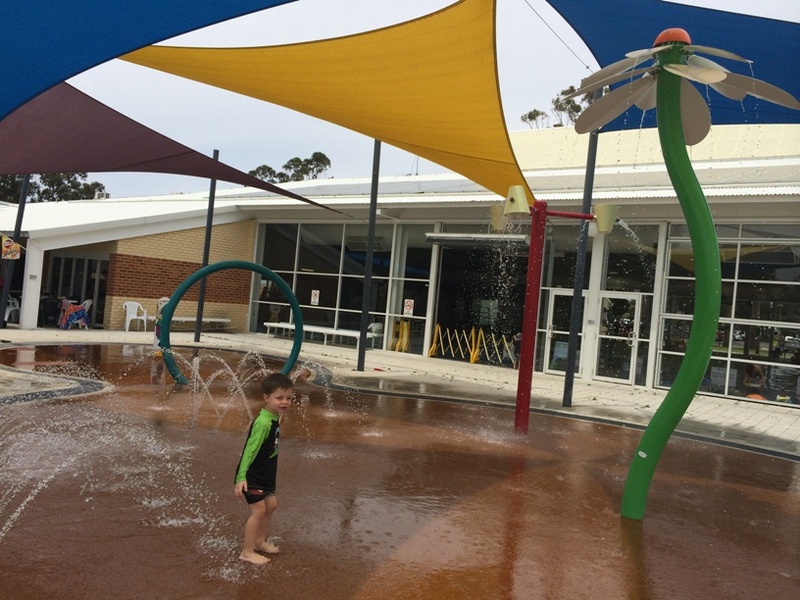 Heated water playground open all year round and is part of your entry. Entry for under 5's is free. 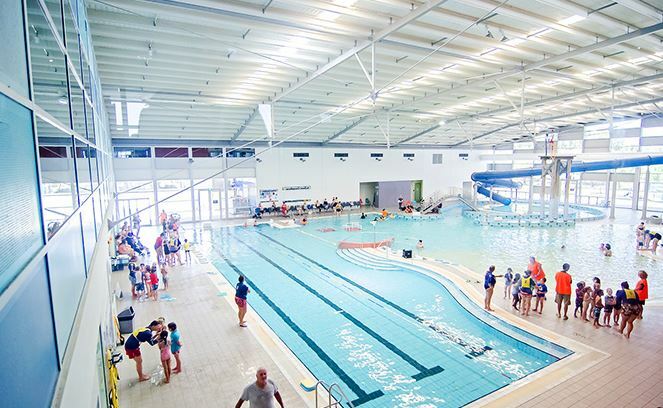 Indoor and outdoor pools, grassed area, playground, BBQ and kiosk too. 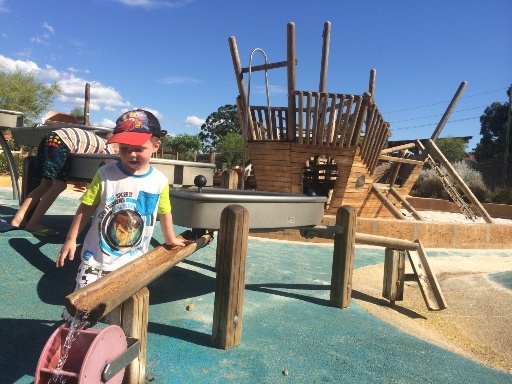 Huge adventure playground with fun water play feature. 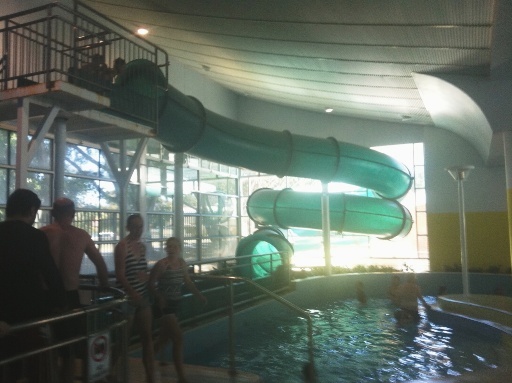 Access to indoor water slide with your entry all year round. Family entry only $16. Indoor kids water cave with mini slides. 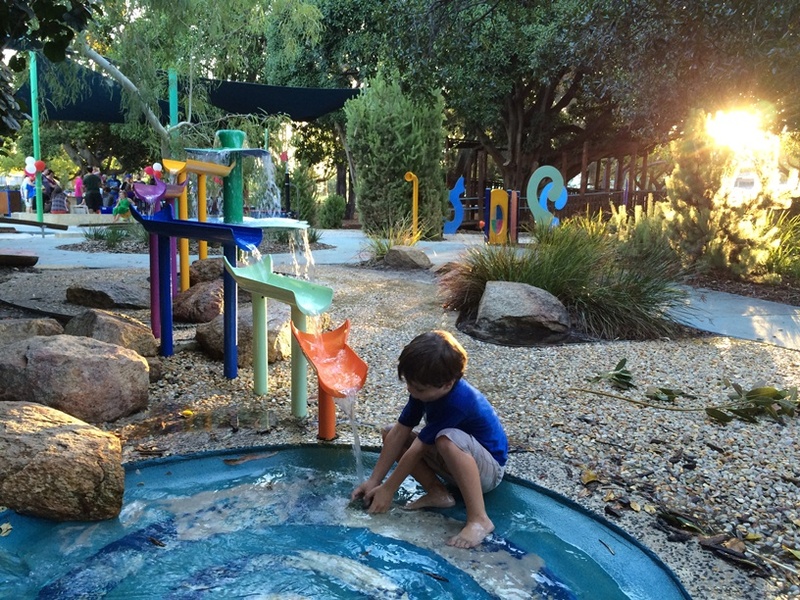 Outdoors two water slides, mushroom fountain and pools including a shallow pool. 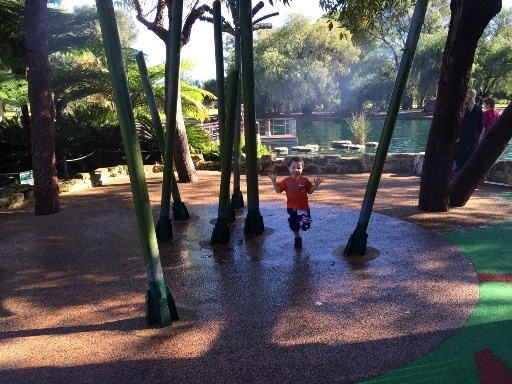 Fantastic fully fenced water playground. 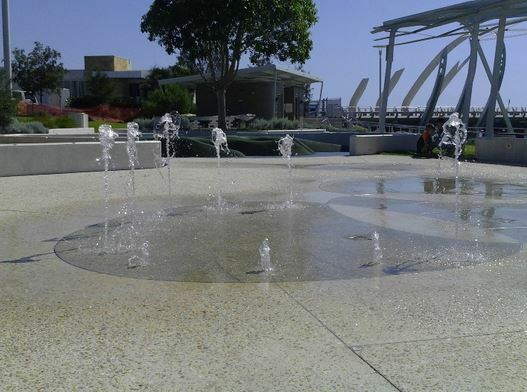 Features a shallow pool beneath several water spouts located in the middle of the pool. Shaded seating areas located around the pool area. 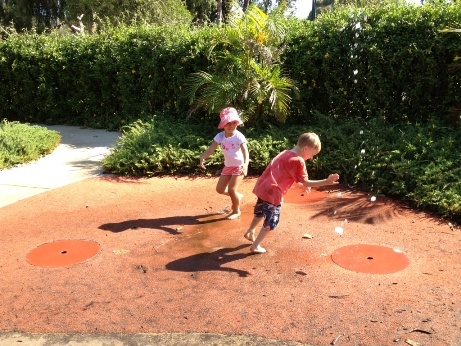 Take your spare clothes along the kids will love running through the water mist forest on the island playground at the amazing Synergy Parkland in Kings Park. Here they can also climb all over dinosaurs and other prehistoric creatures. 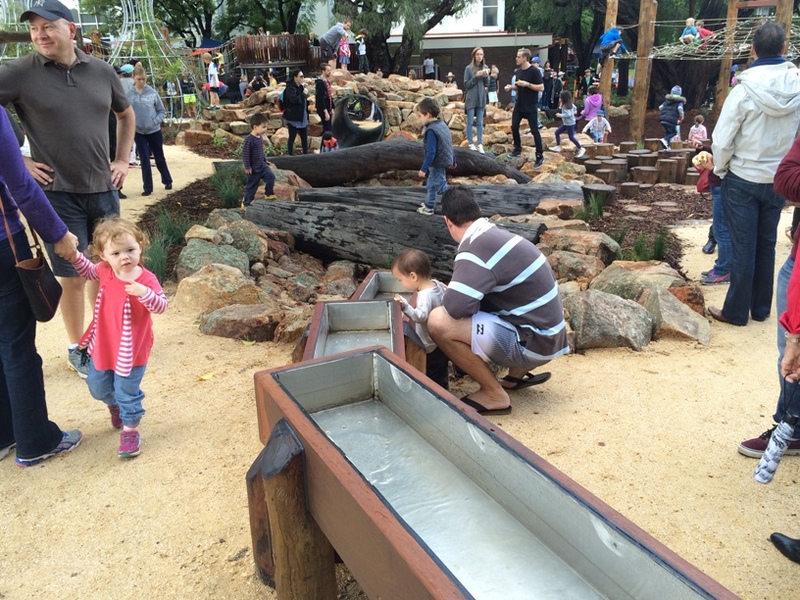 Bring a spare change of clothes to this nature based playground, designed for kids under 6 - they wont be able to resist the great little water play feature. 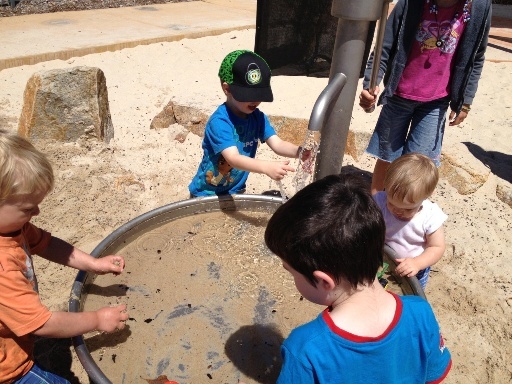 Watch them work together as they gather water and sand and pour it into the funnel! 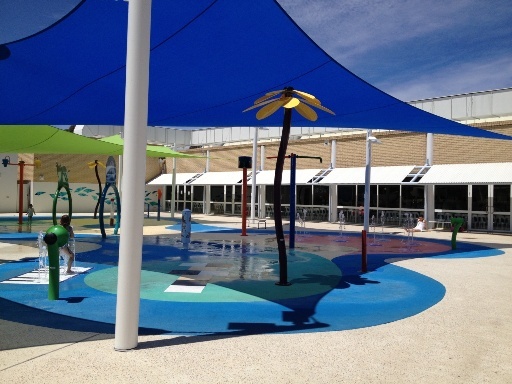 Great little shaded water playground and indoors is casual play pool with beach entry and rapid river. It also has a small stingray little ones will love sitting on and sliding off. 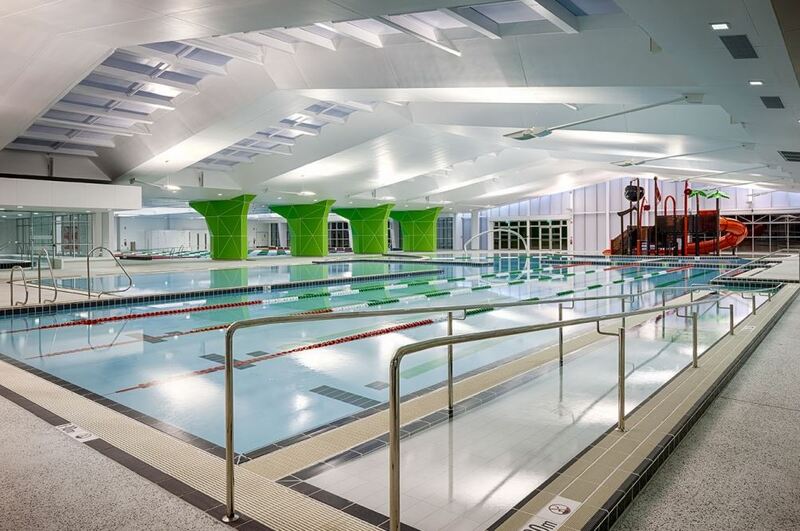 There is a larger lane pool with casual swim section also. 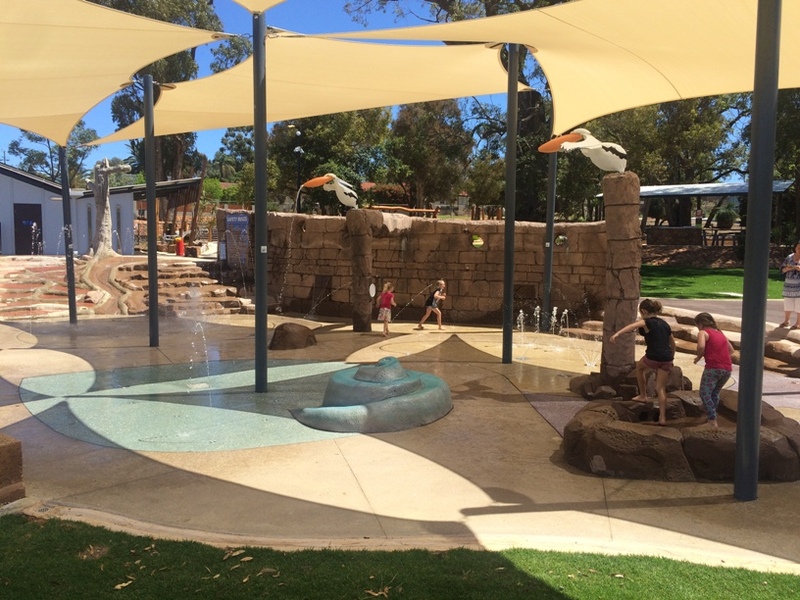 The Kwinana Adventure Park Splash Pad features a variety of sprays and pelicans that fill up and tip water from their bills. 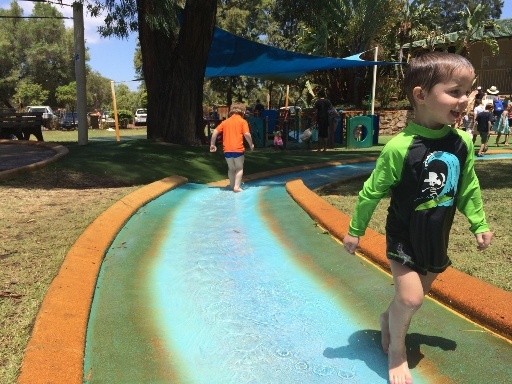 And if you are heading to other parts of WA, from Perth, on holiday this summer make sure you check out these great water playgrounds and water slides! 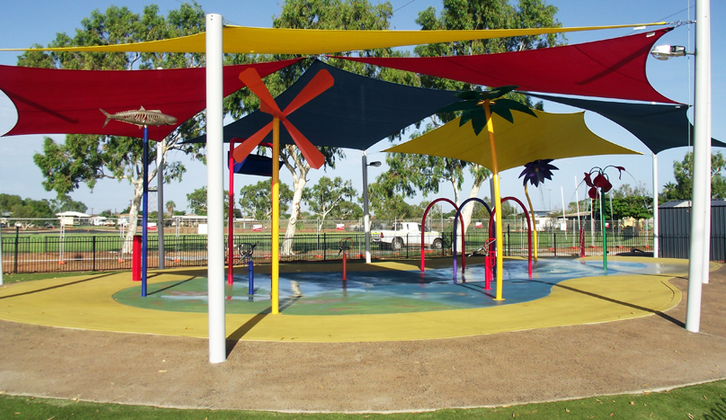 Kids will love the fully shaded, fully fenced, free water playground. Drive about 280km east of Perth and you will find the Kulin Aquatic Centre and this super tall and super long water slide. At 182m long & 18m high it's WA largest regional slide. There are also pools and a water playground here too. Open seasonally head to www.kulin.wa.gov.au for more information on the season dates and entry prices. 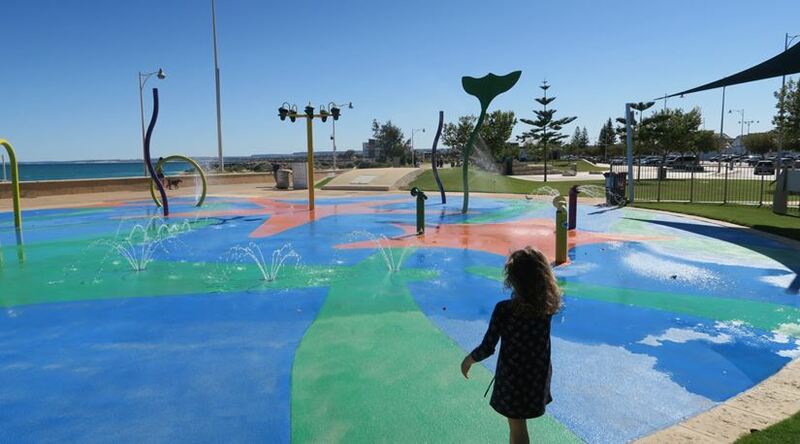 This free water park runs seasonally and is located alongside a big playground too on the beautiful Geraldton Foreshore. 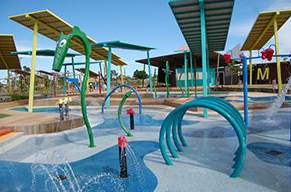 The Town Beach Water Playground meets access specifications so children of all abilities are able to participate in water play here. 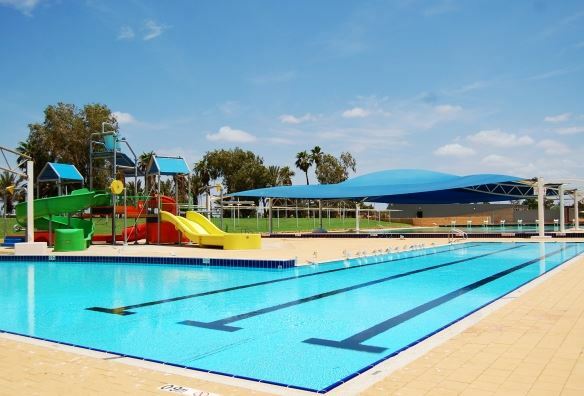 Fantastic water playground at the Karratha Leisureplex. Included in your swim entry, just $16 for a family of four. The biggest water playground in the North West, entry is free. There are also BBQs, picnic tables and a dry water playground here. 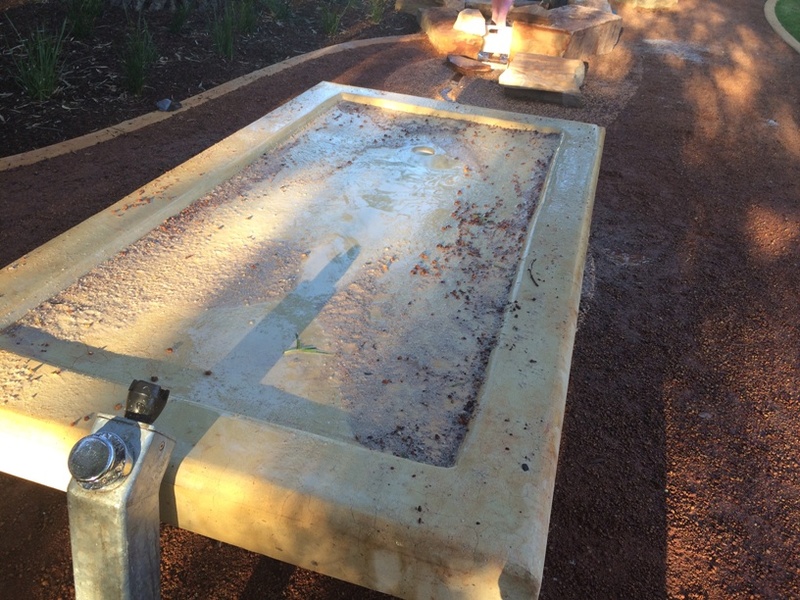 Press the silver buttons on either side of the wave and water mist will spray out, this feature is part of the amazing nature based playground here. Four waterslides, tipping bucket, waterwheel, cannons, fountains and more! Under 4's are free with a paying adult and must be accompanied by an adult at all times. Closed during winter.